To solve NPSC problems using PROC INTPOINT, you save a representation of the network and the side constraints in three SAS data sets. These data sets are then passed to PROC INTPOINT for solution. There are various forms that a problem’s data can take. You can use any one or a combination of several of these forms. The NODEDATA= data set contains the names of the supply and demand nodes and the supply or demand associated with each. These are the elements in the column vector in the NPSC problem (see the section Mathematical Description of NPSC). The ARCDATA= data set contains information about the variables of the problem. Usually these are arcs, but there can also be data related to nonarc variables in the ARCDATA= data set. An arc is identified by the names of its tail node (where it originates) and head node (where it is directed). Each observation can be used to identify an arc in the network and, optionally, the cost per flow unit across the arc, the arc’s capacity, lower flow bound, and name. These data are associated with the matrix and the vectors , , and in the NPSC problem (see the section Mathematical Description of NPSC). Note:Although is a node-arc incidence matrix, it is specified in the ARCDATA= data set by arc definitions. Do not explicitly specify these flow conservation constraints as constraints of the problem. In addition, the ARCDATA= data set can be used to specify information about nonarc variables, including objective function coefficients, lower and upper value bounds, and names. These data are the elements of the vectors , , and in the NPSC problem (see the section Mathematical Description of NPSC). Data for an arc or nonarc variable can be given in more than one observation. Supply and demand data also can be specified in the ARCDATA= data set. In such a case, the NODEDATA= data set may not be needed. The CONDATA= data set describes the side constraints and their right-hand sides. These data are elements of the matrices and and the vector . Constraint types are also specified in the CONDATA= data set. You can include in this data set upper bound values or capacities, lower flow or value bounds, and costs or objective function coefficients. It is possible to give all information about some or all nonarc variables in the CONDATA= data set. An arc is identified in this data set by its name. If you specify an arc’s name in the ARCDATA= data set, then this name is used to associate data in the CONDATA= data set with that arc. Each arc also has a default name that is the name of the tail and head node of the arc concatenated together and separated by an underscore character; tail_head, for example. If you use the dense side constraint input format (described in the section CONDATA= Data Set), and want to use the default arc names, these arc names are names of SAS variables in the VAR list of the CONDATA= data set. If you use the sparse side constraint input format (see the section CONDATA= Data Set) and want to use the default arc names, these arc names are values of the COLUMN list variable of the CONDATA= data set. PROC INTPOINT reads the data from the NODEDATA= data set, the ARCDATA= data set, and the CONDATA= data set. Error checking is performed, and the model is converted into an equivalent LP. This LP is preprocessed. Preprocessing is optional but highly recommended. Preprocessing analyzes the model and tries to determine before optimization whether variables can be "fixed" to their optimal values. Knowing that, the model can be modified and these variables dropped out. It can be determined that some constraints are redundant. Sometimes, preprocessing succeeds in reducing the size of the problem, thereby making the subsequent optimization easier and faster. The optimal solution to the equivalent LP is then found. This LP is converted back to the original NPSC problem, and the optimum for this is derived from the optimum of the equivalent LP. If the problem was preprocessed, the model is now post-processed, where fixed variables are reintroduced. The solution can be saved in the CONOUT= data set. Consider the following transshipment problem for an oil company. Crude oil is shipped to refineries where it is processed into gasoline and diesel fuel. The gasoline and diesel fuel are then distributed to service stations. At each stage, there are shipping, processing, and distribution costs. Also, there are lower flow bounds and capacities. In addition, there are two sets of side constraints. The first set is that two times the crude from the Middle East cannot exceed the throughput of a refinery plus 15 units. (The phrase "plus 15 units" that finishes the last sentence is used to enable some side constraints in this example to have a nonzero rhs.) The second set of constraints are necessary to model the situation that one unit of crude mix processed at a refinery yields three-fourths of a unit of gasoline and one-fourth of a unit of diesel fuel. Because there are two products that are not independent in the way in which they flow through the network, an NPSC is an appropriate model for this example (see Figure 4.6). The side constraints are used to model the limitations on the amount of Middle Eastern crude that can be processed by each refinery and the conversion proportions of crude to gasoline and diesel fuel. The ARCDATA= data set contains the rest of the information about the network. Each observation in the data set identifies an arc in the network and gives the cost per flow unit across the arc, the capacities of the arc, the lower bound on flow across the arc, and the name of the arc. Note that the SAS variable names in the CONDATA= data set are the names of arcs given in the ARCDATA= data set. These are the arcs that have nonzero constraint coefficients in side constraints. For example, the proportionality constraint that specifies that one unit of crude at each refinery yields three-fourths of a unit of gasoline and one-fourth of a unit of diesel fuel is given for refinery 1 in the third observation and for refinery 2 in the last observation. The third observation requires that each unit of flow on the arc thruput1 equals three-fourths of a unit of flow on the arc r1_gas. Because all crude processed at refinery 1 flows through thruput1 and all gasoline produced at refinery 1 flows through r1_gas, the constraint models the situation. It proceeds similarly for refinery 2 in the last observation. The following messages, which appear on the SAS log, summarize the model as read by PROC INTPOINT and note the progress toward a solution. NOTE: Number of nodes= 14 . NOTE: Number of supply nodes= 2 . NOTE: Total supply= 180 , total demand= 180 . NOTE: Number of arcs= 18 . NOTE: Number of <= side constraints= 0 . NOTE: Number of == side constraints= 2 . NOTE: Number of >= side constraints= 2 . NOTE: Number of side constraint coefficients= 8 .
problem solved by the Interior Point algorithm. NOTE: Number of == constraints= 16 . NOTE: Number of >= constraints= 2 . NOTE: Number of constraint coefficients= 44 . NOTE: Number of variables= 18 . NOTE: After preprocessing, number of == constraints= 3. NOTE: After preprocessing, number of >= constraints= 2. NOTE: The preprocessor eliminated 13 constraints from the problem. NOTE: The preprocessor eliminated 33 constraint coefficients from the problem. NOTE: After preprocessing, number of variables= 5. NOTE: The preprocessor eliminated 13 variables from the problem. NOTE: There are 10 sub-diagonal nonzeroes in the unfactored A Atranspose matrix. triangular regions along the factors leading diagonal. NOTE: Bound feasibility attained by iteration 1. NOTE: Dual feasibility attained by iteration 1. NOTE: Constraint feasibility attained by iteration 1. NOTE: The data set WORK.SOLUTION has 18 observations and 10 variables. NOTE: There were 18 observations read from the data set WORK.ARCD1. NOTE: There were 6 observations read from the data set WORK.NODED. NOTE: There were 4 observations read from the data set WORK.COND1. The first set of messages shows the size of the problem. The next set of messages provides statistics on the size of the equivalent LP problem. The number of variables may not equal the number of arcs if the problem has nonarc variables. This example has none. 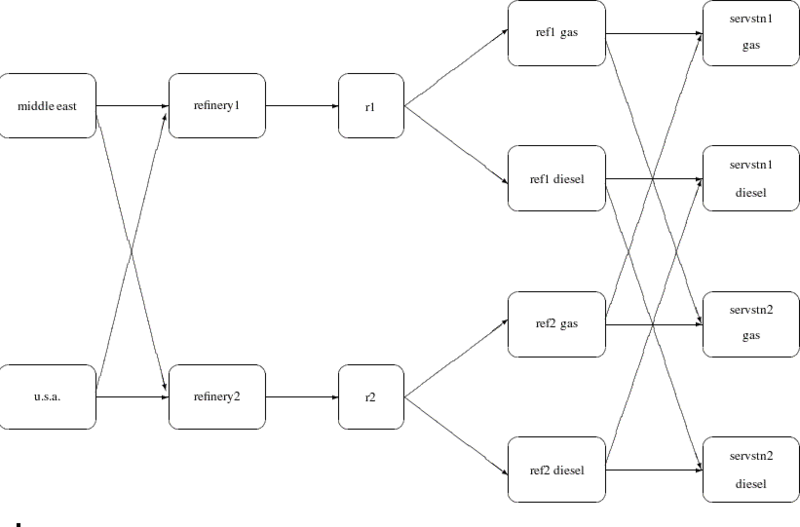 To convert a network to the equivalent LP problem, a flow conservation constraint must be created for each node (including an excess or bypass node, if required). This explains why the number of equality constraints and the number of constraint coefficients differ from the number of equality side constraints and the number of coefficients in all side constraints. If the preprocessor was successful in decreasing the problem size, some messages will report how well it did. In this example, the model size was cut approximately in half! 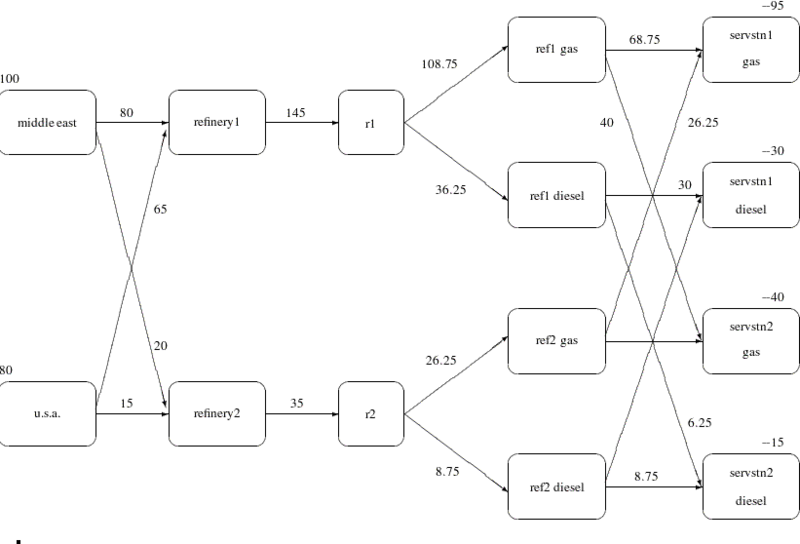 The next set of messages describes aspects of the interior point algorithm. Of particular interest are those concerned with the Cholesky factorization of where is the coefficient matrix of the final LP. It is crucial to preorder the rows and columns of this matrix to prevent fill-in and reduce the number of row operations to undertake the factorization. See the section Interior Point Algorithmic Details for a more extensive explanation. Notice that, in CONOUT=SOLUTION (Figure 4.7), the optimal flow through each arc in the network is given in the variable named _FLOW_, and the cost of flow through each arc is given in the variable _FCOST_.